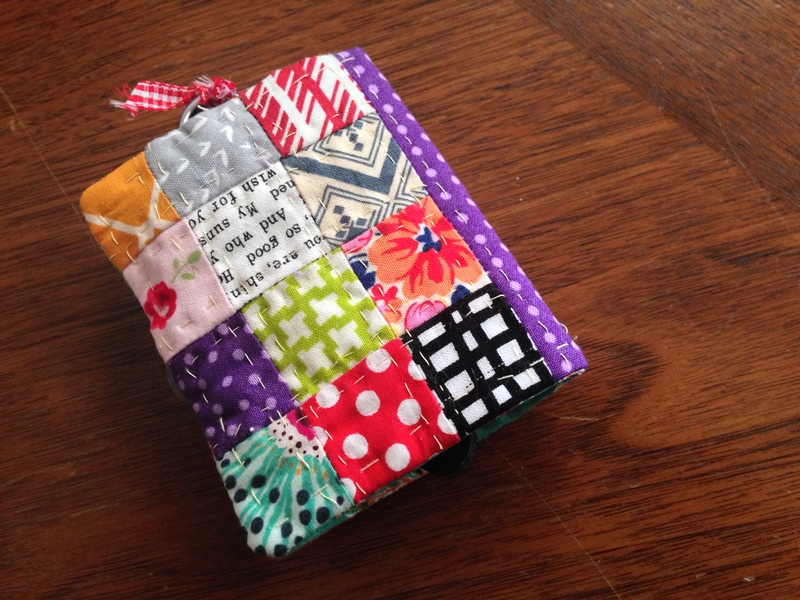 Here is a change of pace… a blog entry about quilting on a quilting blog! Sharing my looooong list of WIPs…. Project Linus Quilts – I have 9 more I want to make before year end. I have one top done, and several unused quilt blocks in bright colors. My goal was 1 quilt per month, but has been only 1 quilt per 3 months. Lots to catch up on. Luckily I mostly just need to quilt and bind. I have lots of blocks to use. The Colorado Quilt. Despite a giant list of projects waiting for me, I lost one whole weekend to making scrappy log cabin blocks to frame the row-by-row patterns I collected in Colorado. The blocks are so full of color and joy. I really want to get back to this project. The Living Room Wall Hanging. Again. One of the last projects I finished before I got my Juki (I love my Juki) was a wall hanging for the living room featuring curved blocks. Loved the fabric. Loved the pattern. But my sewing was sub-par. 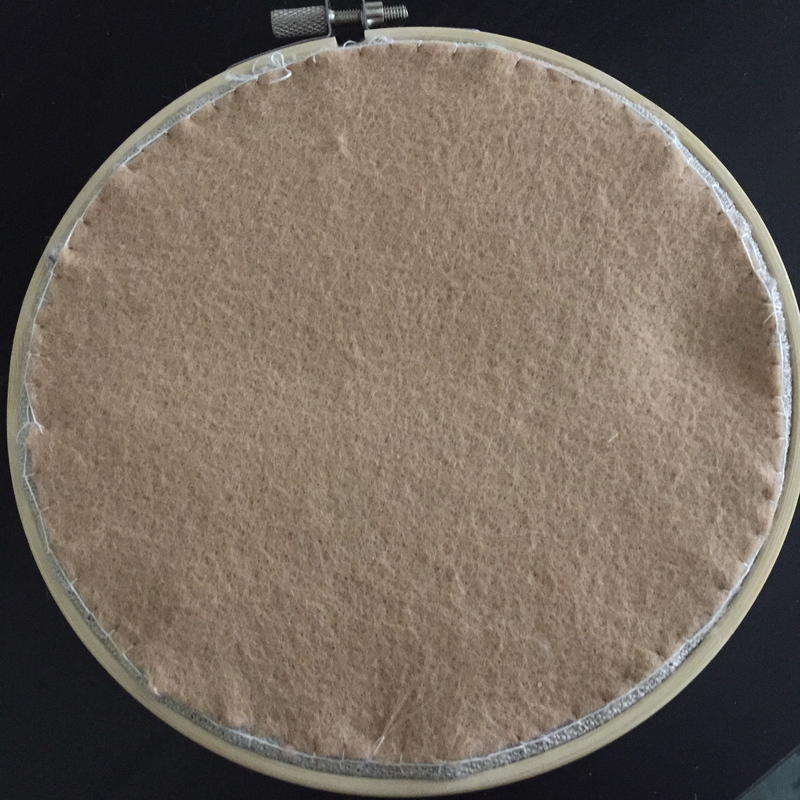 My skills and sewing machine weren’t suited for the project. I then got really bummed out that a bunch of gross light black dye stains got on the quilt when I washed it. My husband claims I am the only one who can see them. I know he is lying. And I am so sick of seeing them. I am working on a replacement from pattern in Quilt Now. I love how the new quilt will look. And so looking forward to not facing that stain every day. Poppies! Earlier this year my mom and I collaborated on a quilt as part of a challenge from our Modern Quilt Guild. We didn’t finish in time, but it is such a cool project that I would like to see to completion. It is a representation of the World War 1 Museum in Kansas City. Everything is done except for appliqueing on the poppies. Tessellation Quilt. This one is for the love of fabric. I have the fabric, I have the desire. I hate paper piecing. But the good stuff sometimes takes the most fortitude. And the quilt will be amazeballs. Big Charming Bed Quilt. This one is a bit anachronistic – It is a quilt for our bedroom – the one room in our house that is tres grown up. It is a very modern pattern in very French General fabric. I just need to piece the top. This one I will have to send out for quilting. I love my Juki, but not that much. Heather Bailey Framed Improv. I lurvs Heather Bailey. And I want to use every bit of my fabric from my scrap pile. I started these controlled improv blocks to make a quilt for the chair in my studio. Embroidered Baby Quilt. This one is secret sewing. So only tiny sneak peaks. DaBombDiggity Baby Quilt. I love this project so much. Good news is the shower is on Friday. So tick tock. Pretty Little San Francisco. Love Satsuma Street. Love this pattern. That is a full and truthful accounting. It does not included the other 3 baby quilts I need to get done this year. Or the stuff I just added to my to-do list because I was stupid enough to look at the Purl Soho website – an advent calendar, scarf, gloves, overnight bag. 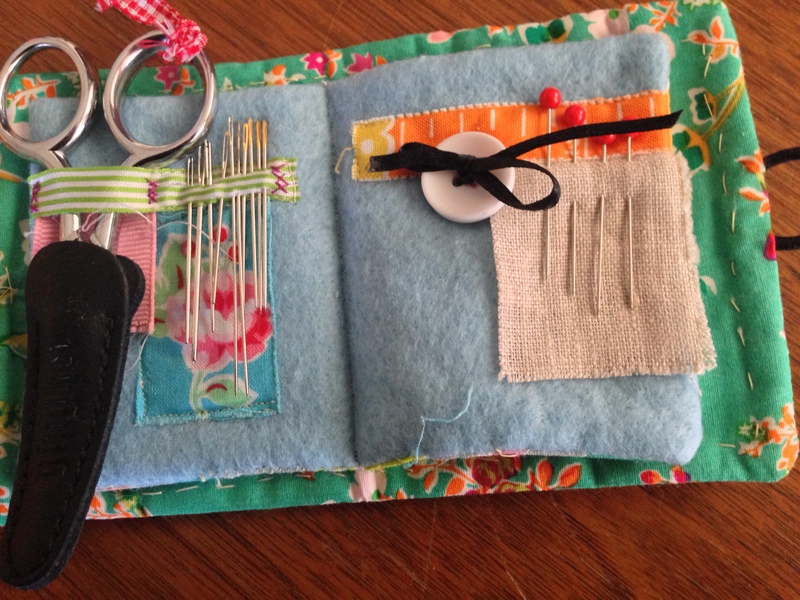 Or the sewing kit I want to make. That is 26 projects. 26! I want to finish before the end of the year. I think I may need to reset my expectations. One day at a time. 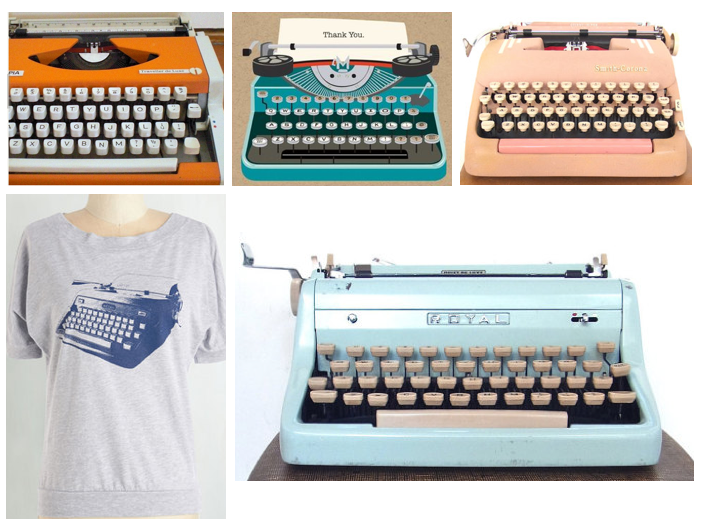 I love typewriters… and the internet. A total cliche, but I have developed a love for old typewriters. Last year, my calendar at work was gorgeous pictures of candy-colored vintage typewriters. I loved them. And occassionally I will do a little wistful shopping for vintage typewriters on etsy. They seem to be full of romantic notions for me – beautiful design and colors and the possibility of writing great things. 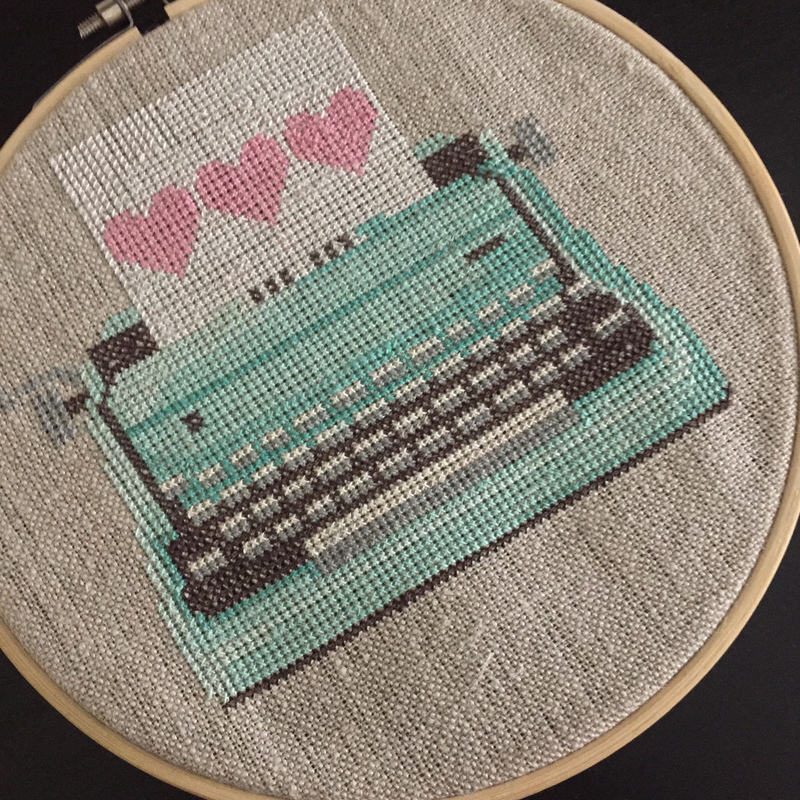 When I finished my Pretty Little Paris cross stitch, I decided I wanted to try stitching on linen. I went looking for a great typewriter pattern. I thought the one solid shape would help with the counting part of counted cross stitch on those tiny linen squares. I was right. The back is a mess, but I was able to keep track of what stitch went where. I love this little piece – it looks a lot like the Royal typewriter above, doesn’t it? So, the internet. 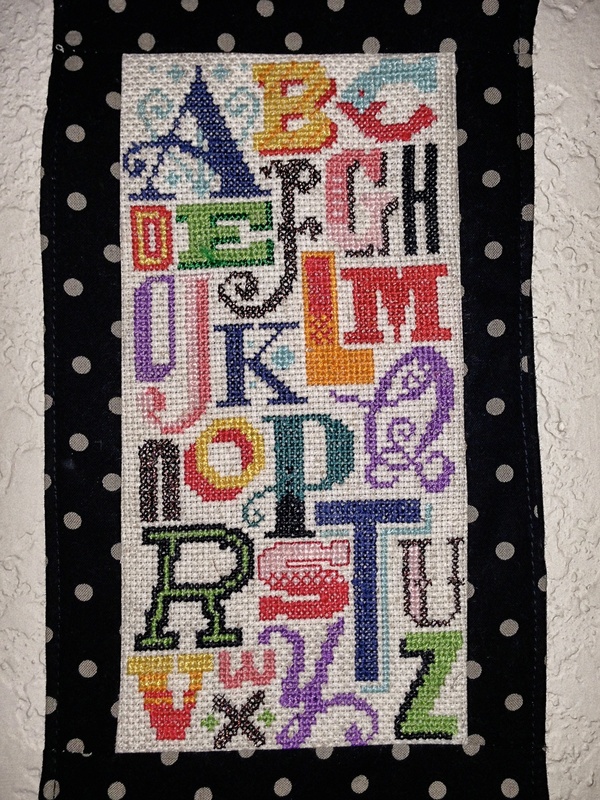 I was a little befuddled on how to finish the cross stitch I have completed. I wanted to use hoops – I think that looks so sweet. I thought maybe you glued the fabric onto the hoop? So wrong. Luckily I found this helpful tutorial. And it worked beautifully!! Pretty good looking for the back of something. Because the back of my cross stitch really is very private. Trust me. Many of the people I love the most have their birthdays in the next few weeks. I want to make each one of them a little cross stitch on a card. Similar to the Pretty by Hand projects here. Mine won’t be as cute, most likely, but they will be filled with as much love. First up was this urn of flowers I created for my mom. Those french knots are hard for me, but I am getting better. 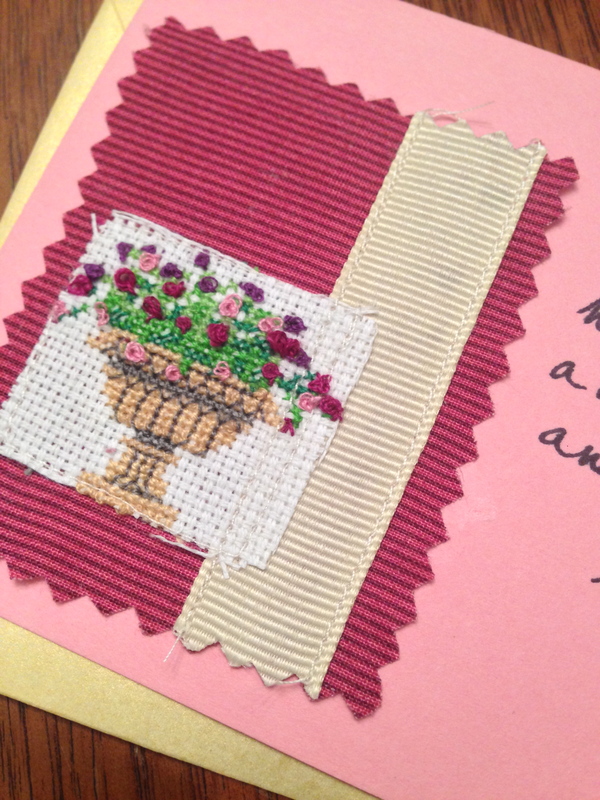 I hard-core covet everything that Kristyne at Pretty By Hand makes. But especially loved this needlebook. I love the colors, the bits of lace, the bit of ruler. This needlebook. For reals so beautiful. The problem is I couldn’t figure out how to make one. After a total failure of trying to figure it out myself, I found this tutorial. 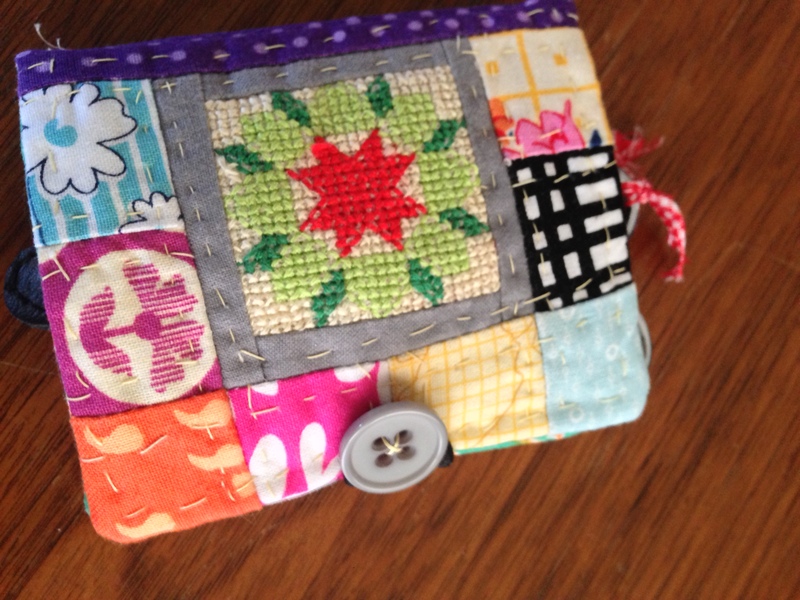 My needlebook is not as cute, and the colors are not as sweet. But it makes me so happy. Love rainbows. Love all the little bits and bobs. Finally a needlebook of my very own.